Would you believe that it's possible to do a bike ride taking in no fewer than 5 ferry crossings, in a single day? 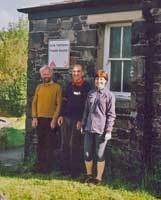 Well I didn't either, and it's actually much better to do the trip over 2 days, staying overnight at Lochranza Hostel. A party of 12 cyclists, some from the 'Mellow Velo' group, the rest from the Edinburgh Ski Touring Club (ESTC) and CTC, made the trip over the first weekend of October, travelling first to Ardrossan from Edinburgh by train or car. Because of problems of getting large numbers of bikes on one train, we agreed to make our own way. The lucky ones went for the earlier (9.45) crossing to Brodick - they sat out the worst of the rain in a cafe. Four of us, less lucky, met at Glasgow Central at 11, aiming for the next (12.30) crossing. Then the rain came in - and how! The line was flooded at Glengarnock, so all trains stopped at Johnstone, with bus replacement. We thought we stood no chance of the bus, and decided to ride the 20 miles or so to Ardrossan. Big mistake! We took the Lochwinning cycle path, the water cascading down the banks of the cutting, rain lashing our faces as we toiled against the wind. We reached Ardrossan, half drowned, only just in time for the 3.30 crossing! The road from Brodick follows the coast for a while - we watched seals basking, or maybe shivering, on the rocks - then it climbs heavily over Glen Sannox before plunging down to the coast again at Lochranza. The deer were in full rutting mode and clearly weren't to be put off by a few passing cyclists! Gave a whole new meaning to the concept of 'ruts in the road' (duh!). As is customary on MellowVelo trips we organised a communal evening meal. Alan did an excellent onion soup, then we had a spicy veg stew followed by crumble and custard. Sunday morning turned out as fine as the Saturday had been bad. We began the day with our first ferry, Lochranza to Claonaig, about 30 mins, climbed a big hill over the spine of the Kintyre peninsula, with fabulous views back to Arran, then descen ded to West Loch Tarbert, and along a rather quiet A83 into Tarbert, where we found a cafe overlooking the harbour, to occupy us until the 12.15 ferry to Portavadie - another 30 mins. Portavadie looks like a former military base trying to re-invent itself as a marina, and we found further military evidence at the next village, where a monument records the workers' deaths in a series of explosions at the local gunpwder factory - now closed down, fortunately! Back to sea level again at Tighnabruaich, a beautiful strung-out village on the Kyles of Bute, with Bute barely quarter of a mile away across the water, inaccessible except by boat - and no roads or habitation over there anyway. This was our lunch stop. We had cycled less than 20 miles, but with the hills it felt like at least double! And the hills so far were as nothing compared with the climb out of Tighnabruaich, which took us from sea level to 273m - a beautiful road through forest, with occasional magnificent views down the Kyles and across to the Ayrshire mainland. Then it was back to sea level again as we continued north up Loch Riddon, to the junction at Glendaruel, then south on the other side of the loch, and back to the Kyles. A new section of road here goes inland; we hoped to avoid the hill by taking the old road, but although close to the coast, it does a series of short sharp climbs, and twists itself round amazing bluffs before re-joining the new route at Colintraive. 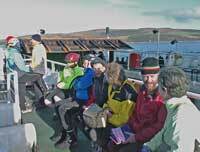 Here we took our fourth ferry, a 5-minute ride over the Kyles and onto Bute, then it was an 8-mile relatively flat ride to the holiday towns of Port Bannatyne and Rothesay. We just had a few minutes to look at the famous Victorian toilets there, before embarking on our fifth and final ferry to Wemyss Bay. We had about an hour to wait for a train, but a well-known cafe opposite the station kept us out of trouble. Meanwhile, those who'd brought cars to Ardrossan faced the choice of riding the 18 miles down the coast (the CTC-types did that) or taking a taxi to collect the car (guess who did that!). The train posed six of us one more problem - engineering works and bus replacement between Paisley and Glasgow Central. By now it was dark - but no problem - they laid on two whole buses just for us, the bikes going in the boot. That's what I call service! The consensus was that this was a very worthwhile and quite unusual trip. Using 'Island Hopscotch', we only had to buy two ferry tickets, at total cost of about £16, and the return train fare to Ardrossan was valid for coming back from Wemyss Bay. The Hostel also had a 25% discount offer, so it wasn't an expensive weekend. Looks like this could become an annual fixture! Four of us went on this trip. It took ten hours to get from Carstairs to the hostel at Melrose, even with perfect cycling weather (cloudy, cool, dry and a light following wind). of this summer. We reached the hostel after dark via a muddy "shortcut". Sunday was sunny! Scott's view was excellent. 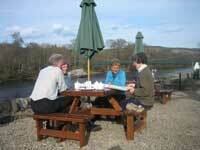 But a very relaxed lunch at Kelso meant that we had to rush a bit in the early afternoon. and duller than the Tweed Cycleway route via Coldstream, and lacks any tea stops. Next time I'll try something a bit shorter. Well, we had a lovely dry, and at times, sunny weekend. There was a lot of wind on Saturday and fortunately for us it was mostly at our backs. Sheelagh and I had started from Taynuilt, and headed east towards Dalmally, hoping to meet Keith near Claddich junction. We resisted the temptation of Cruachan power station (relatively easy) and a café at Loch Awe (much harder) not catching him up until the hotel at Port Sonachan. Our expectations of a pleasant lunch sitting on the terrace overlooking the loch were somewhat marred by there being a stag party in full swing. As it had started the previous evening, the participants were in the state you’d expect. We did hope they’d go skinny dipping but they weren’t quite drunk enough at that point! The views along Loch Awe were simply superb. 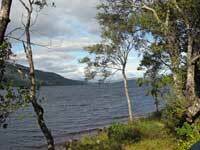 Although the south east road is the major road along the loch it is also the quieter of the two. There were groups fishing and others enjoying their barbeques. Kilmartin Hostel was as good as ever. Next morning we set off along the North side. This area is studded with prehistoric remains. Most are around Kilmartin but there are a few further afield. The north side is a lot hillier so we were very glad to see a café in Dalavich. The ‘open’ sign was in running neon lights as indeed was a picture of a motorbike inside. We were pleasantly surprised to find an extensive menu of snacks and light meals. After sampling a selection we set off north again. We took a detour at Kilcrenan to go to Ardanaiseig where there is a hotel set in pleasant parkland and gardens. There was only time for a brief look at these before returning to Taynuilt. Keith went onto follow the NCN route through the lovely quiet Glen Lonan to Oban to catch the train home. Well, the weather turned out to be wonderful. Eight turned up at Auchendinny to cycle to Dolphinton for lunch. The gardens were lovely in the sunshine. They were created as a setting for Ian Hamilton Finlay's sculptures and concreate poetry. 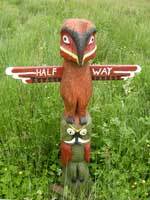 The overall impression is of woodland with many paths dotted with thoughts and sculptures. There is a kitchen garden, a pond and open areas away from the house that merge into the landscape beyond. Much of the work is a strong theme from WWII and many of the thoughts play on a few words ever changing the word order. A truly unique place. In the gentle countryside of Dumfriesshire last year we discovered Harry’s gift for combining sun and cycling, so a small but game group gathered at Bridge of Earn sharp on Saturday 2nd August 2008 for a tour of the best of Perthshire. In the morning we enjoyed the easy B939 to Forgandenny then Torhill, on the way to lunch in the pub at Glenfarg. As we began our first ascent to of the afternoon I recalled that this county is as known for its hills and glens as the south west is for its plains. Gears were tested out (and adjusted) on the steep brae leaving Glen Deiglie, not at all helped by the desperation of SUVs to pass at all costs on the narrow roads. We reached the flatter section that cuts through the area’s extensive fruit farms, still producing berries in late summer thanks to acres of white plastic, and were making headway when there was a screech of brakes…Tiana had spied wild raspberries in the hedgerows. In abundance. And delicious. We wound our way along the route stopping at every fruity bush, until, scratched, juice-stained and gorged, we had had enough. We needed the fuel for a long pull up to the hill top with great views, then had a fab downhill run to Dunning, our overnight stop. Dunning is a cute village with fine restaurants and a wee hotel that put us up for not too much. A couple has just taken over and pulled out all the stops in the food department. It was lovely wandering round on the balmy evening walking it all off. Dunning was once a significant town and has good ruins. On Sunday the cycle was less hilly and took us northwestwards to Aberuthven (coffee and buns) and then via Kinkell Bridge to a small place called Madderty which just happens to be where my dad grew up, and my cousin James still farms. I dashed on ahead and found James up a ladder fixing his roof, so we sorted out a cuppa for the cyclists, and I caught up on ten years of news. This really made the trip for me! We later lunched by the roadside, noting the scattering of new housing in Perthshire, much of it rather out of sympathy with its rural setting. However, there is still plenty of Perthshire left over. A last hill took us up through Dupplin Castle Estate then we cycled easily along the river Earn to the Bridge thereof, to be reunited with our cars. Well done Harry, another good trip! Taking the train from Edinburgh, Tiana generously going on the earlier train, the five of us set off from Dunblane station at about 11 a.m. 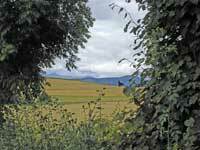 Taking a backroad, we were soon out of the town and enjoying the views of Perthshire hills to east and west. We arrived in Braco – the centre of Scotland’s earthquakes – within an hour noting but not stopping at Ardoch Roman Fort. The wind got up but it seemed to keep the rain away. A quiet road east took us to Gleneagles where we had a picnic and then headed for Auchterarder for coffee and muffins. We sought out Tullibardine Chapel, built in 1446 for the Earls of Atholl, and found a wedding taking place. Travelling north to Kinkell Bridge, we decided we had the energy to cycle further east, picking up the Roman road to Findo Gask and enjoying the honeysuckle and birches. We joined the A9 for half a mile then turned north to Tibbermore. After snacks in a delightful garden centre, we sped into Crieff, got our groceries and cycled south of the River Earn to Comrie. Total mileage 48 - undulating. Comrie Croft was welcoming and comfortable (£15 per night) – with rather a small sitting room but good kitchen and showers. We produced an excellent meal and talked until bedtime. On Sunday we woke to very grey clouds. In Comrie we visited Earthquake House, the site of the world’s first seismometer then sped off to St Fillans and the South Earn Road alongside the loch. Getting somewhat wet, we joined National Route 7 at Edinchip Estate, on A84, and were in the well known Library Tearoom in Balquhidder for coffee and huge cakes by 12 noon. 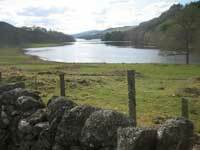 (20 miles) After a visit to Rob Roy’s grave, we continued south on the peaceful Route 7 alongside Loch Lubnaig. 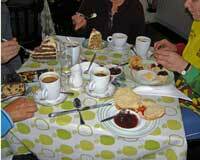 At Kilmahog, we kept south of Callander, taking the A821, A81, B822 and A84 into Doune – for more tea. Fortunately, these roads were not busy. The rain stopped but the sun failed to come out. 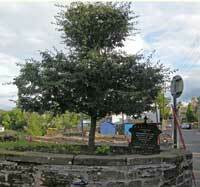 There were three options for the route into Dunblane where we arrived for the 6 p.m. train. Total mileage 48 - undulating. Apart from the rain, the weekend was very enjoyable. We were a group new to one another but that was no problem. All were enthusiastic cyclists who enjoy sightseeing and coffee stops. All had roadworthy bikes and ascended the short sharp hills no bother. 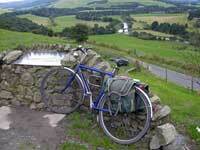 We agreed Perthshire is great cycling country. Fiona's last MV ride was to New Lanark at the end of May. Well, the rest of you missed a great cycle ride. Apart from some light rain on Saturday morning, the weather was good. We enjoyed the coastal views from the NCN1 path to Beal where we stopped for a coffee and scone. Then off to Lowick for lunch at the Black Bull. No Nouvelle cuisine here – large filling portions of good home cooking. We set off slowly for the scenic route to Ford and had managed to gain enough appetite to be tempted by the local ice cream at Doddington. Ford is a picturesque model village built by Lady Waterford from 1859 to house local agricultural and mine workers. In the Lady Waterford Hall (old schoolhouse) there is a gallery of paintings by Louisa Anne, Marchioness of Waterford, painted 1862-1883 depicting biblical scenes using local people as models (like Phoebe Anna Traquair here in Edinburgh). The cultural theme continued at Milfield where we looked round an archaeological exhibition on the people who have lived in the area since prehistoric times. There is also information about the RAF who were stationed there in and between the world wars. From here we went down the dead end road to the river and took the bridleway for a half mile to the bridge and over to Westnewton. From there it was a quiet run into Kirk Yetholm. Sunday took us first to the ruin of Cessford castle then west keeping roughly to the 4 Abbeys route to Monteviot gardens. 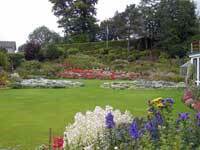 These are lovely peaceful gardens with a fine selection of plants bordering the river Teviot. Great place for a picnic. We, however had no food so we went down the road to Woodside garden centre for a soup and sandwich. From here we headed north to Maxton and crossed the Tweed by the Mertoun bridge to follow the Tweed cycleway back to Kelso. 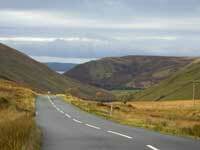 This route gives grand views across the valley. At Kelso we peeked at the Abbey (there is not a lot left of it) and took photos from the millennium viewpoint before heading back to Kirk Yetholm. Monday started with a group photo at the hostel then we headed along the south side of the Tweed to Cornhill and Coldstream. We took a detour to the Hirsel country park for a picnic and ‘drive through’ to pick up the Tweed cycleway again. Lovely quiet roads passing the grand entrances to the Ladykirk estate, onto LadyKirk Church, Norham and the Honey farm at the Chain Bridge where we stopped for coffee and honeycake and a browse round the exhibition. Under an hour later we were back at Berwick, just in time to see a steam train at the station. As it chugged out over the viaduct we thought what a fitting end to a wonderful weekend. We all assembled at the Pitlochry Festival Theatre tea room for coffee and scones with grey skis and a dismal weather forecast to look forward to for the weekend. Fortunately, the BBC website forecast was totally wrong and after an hour or so along Loch Tummel, we had sun for the rest of the weekend. For my money, Highland Perthshire is one of best cycling spots in Scotland and if there were any non believers at the start, I am fairly sure they were all converted to this credo by the end of the weekend. After the south side of Loch Tummel, always a cycling jewel, we turned north along Glen Errochty towards Calvine and then turned south along a dead end road and rough track to find the pedestrian bridge over the River Garry. I have been over it many times, but we discovered, too late, that it had been taken down by the Council in the summer of 2006. We had to retrace our steps and get back to Blair Atholl via the former A9 which was fine and allowed some of to see, courtesy of Sheelagh's penchant for spotting wildlife from the bike, a red squirrel doing "Crouching Tiger, Leaping Dragon" tricks from trees at Struan. By this time, we were hell bent on getting to the Blair Atholl watermill tea room before it closed which we managed comfortably and were suitably rewarded. lived up to its name, but lunchtime found us in the garden of the newly refurbished Fortingall Inn in the sun for lunch and we had difficulty understanding why Pontius Pilate decided to leave this beautiful place for the fleshpots of Rome. After lunch, we did a big climb along the Falls of Keltney and a long downhill to Loch Tummel again with a further ride on the south side back to Pitlochry and the finale of tea and cakes by the River. Because the youth hostel was full, we stayed in the Backpackers Hostel on the main road. A different but still welcome experience except perhaps for Bill and Kathy who were looking after baby Isla in a rather cramped room. It was a small select group - Sheelagh, Barbara, Alec, Tiana with Richard as chiefie for the weekend and Bill putting in a guest appearance on Saturday. Mellow Velo members who did not come - eat your hearts out.